I've been told that the best way to go is to build your own, if you want something that really fits your application...but what other options are available? They used to sell desks that had a pocket for a console, a nice bolster and rack space on the sides, but I haven't seen those in years. I don't use a mixer/console anymore since it would be over kill for my needs. 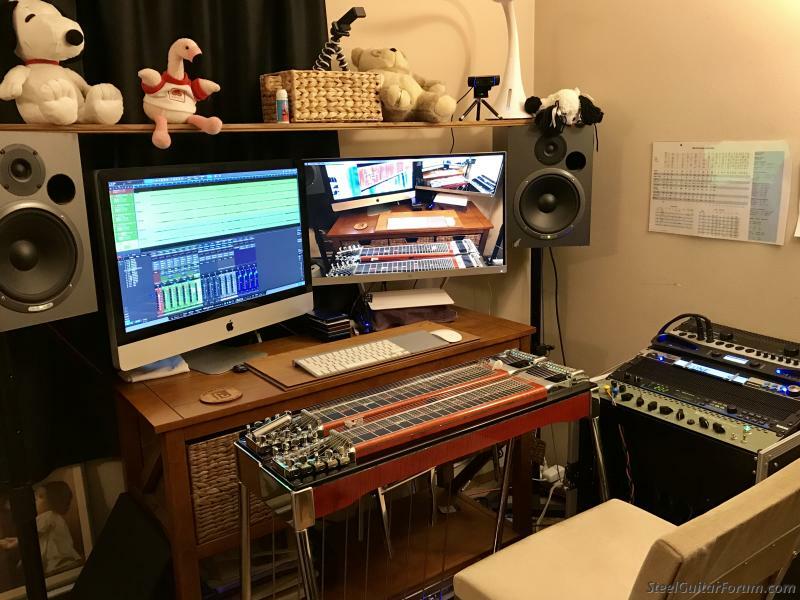 With that being said, Studio RTA makes a couple of different desks that don't have a cut out space for a mixer, but could certainly accomodate one. They're very reasonably priced too. Here's a picture of my studio set up. Hi, Duane, I believe there is currently more Studio Furniture available than ever. Google "studio furniture". Raxxess is one company that makes good, serviceable stuff in many configurations. I have a few of their products, including a large desk. They have various finishes but the cheapest stuff is melamine-covered MDF and if you're careful, you can take it apart and move it and use it for years. 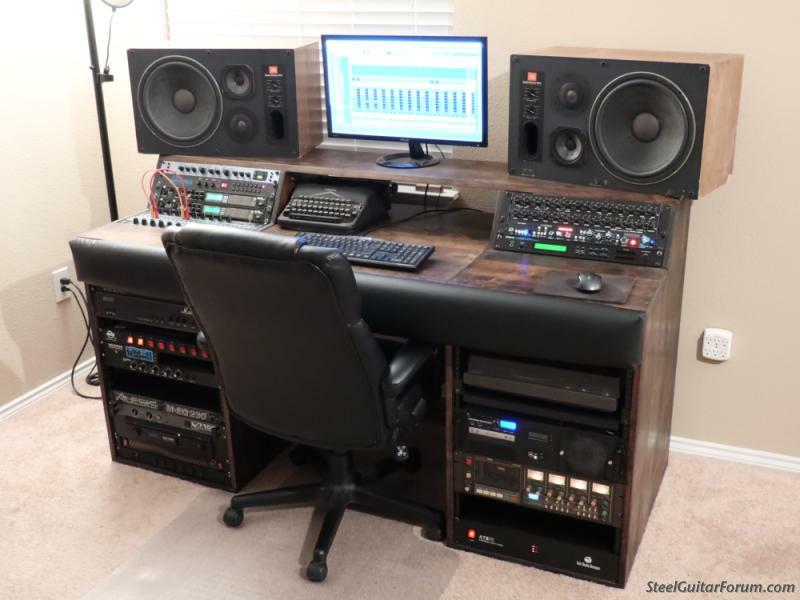 There are some nice looking pieces under "recording studio furniture" on Ebay. 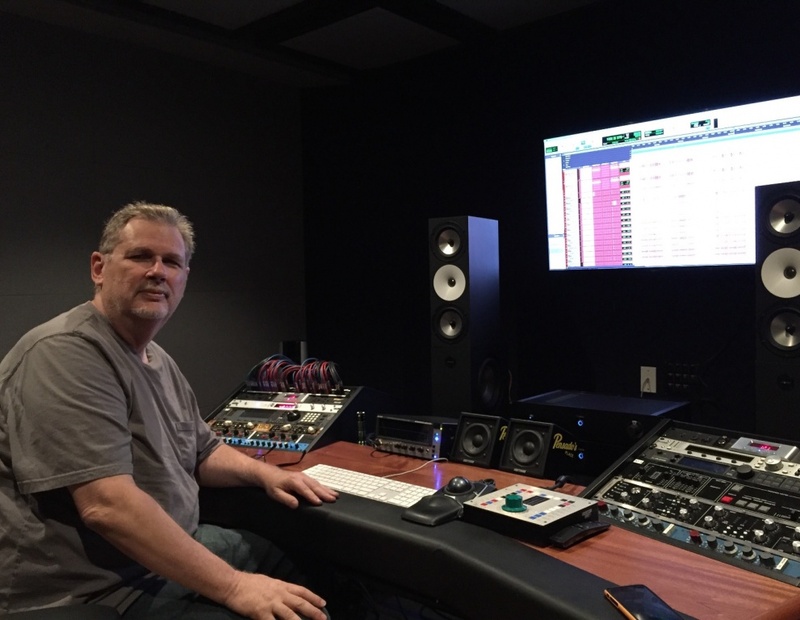 Rick Schacter: What is the device above/behind the computer keyboard in the center of the screen with the faders? It looks like it may be a controller for your DAW. And what DAW are you using? Not trying to jump in front of Rick, but I think that's a Presonus Faderport 8. I'm wanting one myself. Maybe Rick with tell us how it's working for him. Nothing too fancy here... A cheap 100 $ desk from Bi-Mart, with 3 baskets I can access from in front of the steel, a board across the Monitors to display my trophy’s ... easy access to my Magic Pad and Keyboard... when I mix, I put a D2F cover on the Steel and have a couple pieces of 2’ light flooring put together where I have my Keyboard and Magic Pad, which I pull onto the D2F Cover... I can mix right there and have plenty of Monitor (27” ea) to split stuff up and see things well. The device above my computer keyboard is a Personus Faderport 8. Even though I don't have a mixer, I still prefer using faders to mix as opposed to mixing with a mouse. It has the usual transport/record/solo and mute functions. But what I really like about the Faderport 8 is that it's possible to edit FX plugins (in Presonus Studio One). So far it's working well for me. Rick, I’ve been looking at the Fader Port too... to use with Studio One 3.5... my mixing needs are pretty minuscule, as currently I only record to a pre-recorded track, so I’m mainly mixing for balance with that... Can you use this for automation, to tame too loud spots and bring up too soft ones? in real time? Can you use this for automation, to tame too loud spots and bring up too soft ones? in real time? Another thing I really like about it is that I can pull up "scenes". Since I use some virtual instruments, it's nice to be able to punch the "VI" button and look at the mix for virtual instrument without looking at the audio tracks sometimes. You can do the same with buses too. Or if you want to look at all of your tracks at once you can do that too (8 tracks at a time). So far I'm pretty impressed with this unit. If you have a Gander Mountain near you, they are closing and selling all furniture as well. I believe many stores are closing this week FRI , the 28th. 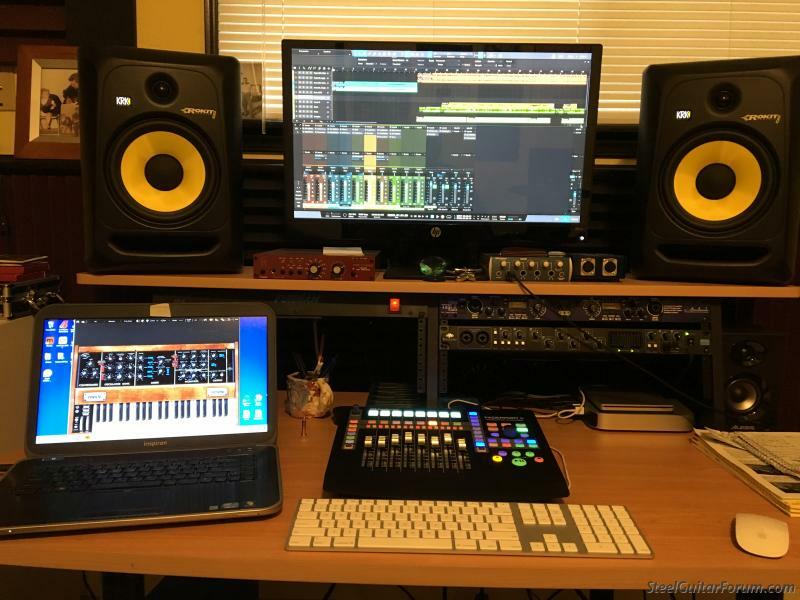 You may be surprised at what they have for sale that can be very home studio friendly for crazy low prices, most are "what will you give me " ! Tables that maybe retail in the $400 range can be had for under $50 , I purchased a small bookshelf on wheels for $20 , I couldn't even make it for $20 ! Give it a shot if you have one nearby. 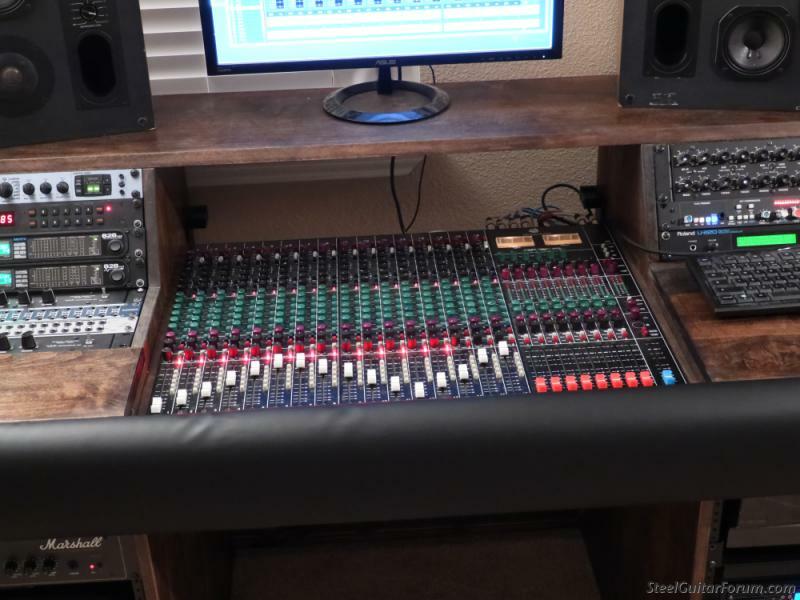 If ya want the real McCoy studio furniture Argosy makes some real nice stuff.. My recording desk is from Argosy and does a fantastic job. Well, nobody had quite what I was looking for, so I just did the only thing there was to do...design and build it myself. I ended up doing all of it myself because I couldn't find a local wood shop to make the parts. That was not the plan but that's how it went. First I had to design it, which took about four months on and off. Here are some models of that in CAD. It took a couple more months to build the thing. The finished product came out pretty satisfactory – made of alder, with some cheaper boards that you don't really see, and a faux (for this first attempt) leather bolster and lots of parts from McMaster-Carr. Some minor imperfections here and there, but it's decent. The main thing I am not proud of is the semi-gloss polyurethane finish, but I'm not going to redo that until I have to break it down and move it. It's fine for now. I also need a new chair but I needed a different one anyway. What about the console? 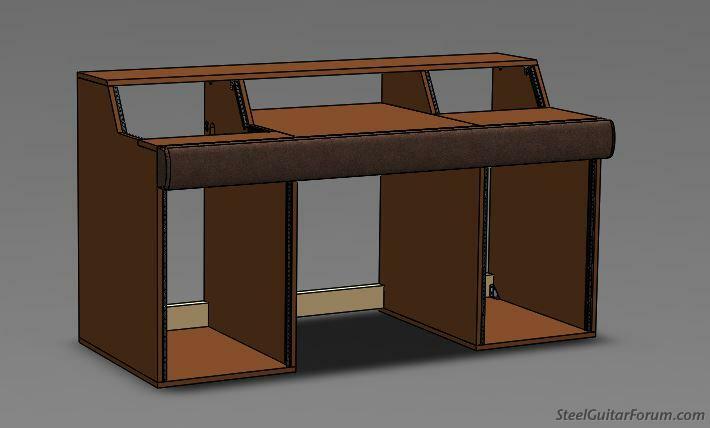 That's under the removable center desktop surface, which sits on the front crossbeam and two rear pedestals on rubber feet. The console is a Toft ATB-16. 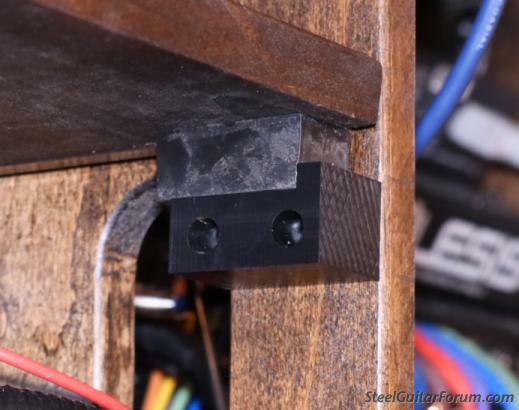 The little pedestals that the rear feet sit on are machined from acetal (Delrin) and have recessed pockets in the top so that the desktop doesn't have a tendency to slide around. I did this instead of having some kind of crossbar because it didn't make sense to have something in there that was going to be in the way and wouldn't add a great deal more strength, since the top overbridge is right above it. Hooking it up was actually pretty easy and fun (yes I've gone crazy) because I designed it to be as easy as possible. 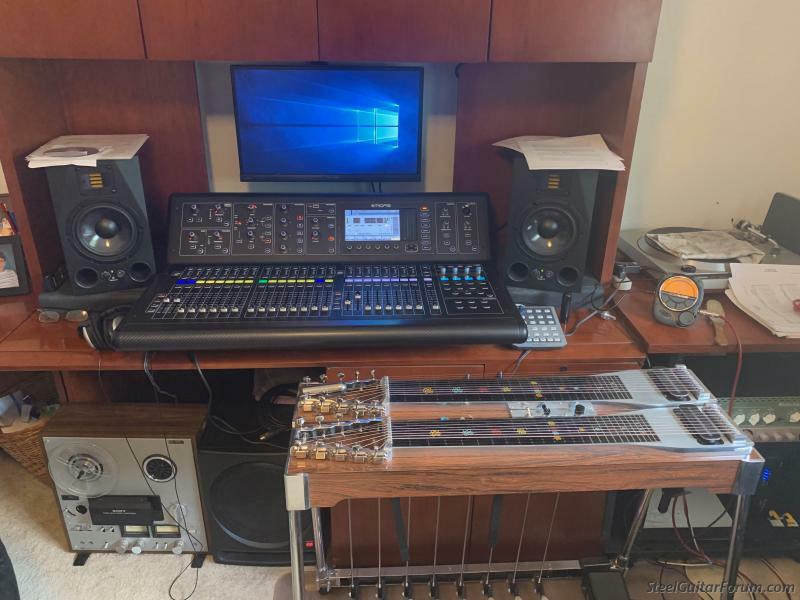 You have most of the stuff used in an audio session on top, in the four racks on either side, and then you have four horizontal rails for the patch bays. It took some messing around to see what fit and what I liked the best...I've since moved the White 4220 eqs down to the lower 15-space rack and put a graphic up there that was shallow enough. Luckily I was able to use short patch cables to go from the converters to the patch bays. I just put a blank panel right below the converters because another bay there would be getting in the way. I might change it up again. The oblong pass-through holes are pretty self-explanatory. I think I might use a piece of grounded shield or something for the power cable I have running through there to run power to the other rack...haven't decided if that's necessary yet. I haven't heard any hum so maybe not but I do think about these things. The bottom crossbeam is nice in that it acts as a dam to hold the spagetti in when you're sliding it out to tinker in the back. Speaking of that, it's harder than I thought! I bet this weighs all of 500 lbs. and has close to 9 square feet of area pushing on the carpet. I can manage it, one side forward at a time, but it's pretty heavy. PHEW!! I tell you, it was a lot of time and hard work, but it's mine!! Besides refinishing it someday, if the bolster covering is worn out, I might have someone professionally upholster it with the real stuff. I see a LOT of Attention to Detail in there that people often do not realize is involvd in a project of that scope. PS: I´m not really a fan of the Exclamation Point [!] but this job is really deserving of a few. Here is my setup at home. Thanks, Michael. Just about every angle of this thing was thought out, mulled over, changed up and reworked in the design phase. I knew that if I was going to put so much effort and money into making this thing, it had better be right. 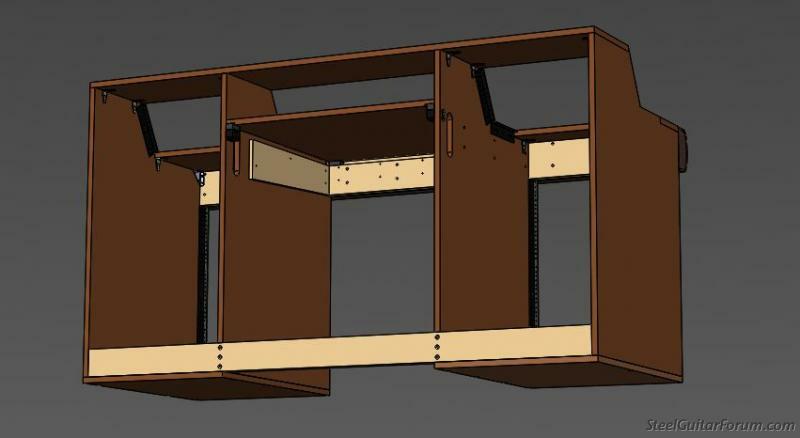 I originally was planning on having some piano hinges make the console come up and forward, but I realized that this was going to be a lot more trouble that it would be worth and would use space less efficiently. Ergonomic design there Duane. You got it done! Now to make good use of your hard work, you would need to position the desk so that the wall behind it presents a mirror image for left and right behind the JBL's. I noticed you have Venetian blinds on the left and nothing behind the right. Mix position placement is important to get a better mix and to create a phantom image. That would be, hearing a stronger stereo image where the vocals are dead in the center and you have a discreet sense of where is left/right and spaces in between. If the wall behind the speakers is not the same on the left as it is on the right, phantom image will be weak or non existent and the mix will suffer. Or if you have a wall or window, on one side of the monitors and none on the other, this imbalance affects the mix and no phantom image will appear. Your mix cues will be off. With phantom image ability, the speakers should disappear and the phantom stage should appear behind the speakers. Then you will have a better mix position accuracy. The room is still part of the equation when dealing with recording. Oh I've got bigger problems than that. Did you notice that both of my monitor cabinets are the same side? I flipped around one of the vent panels, but look at the tweeters and the midrange... It's asymmetrical already. One of these days, I might modify one cabinet – finding a replacement for vintage 1988 midfields is daunting. Maybe I'll just make new cabinets for them one of these days – they're kinda hammered as it is. It's okay though – I'm not running a real studio or anything here. I would definitely apply more rocket science if that were the case, but this setup is really just intended to bring my computer desk and audio tinkering station into one unit that fits me better and is more hansom than what I had before, which was a kluge and a wire mess. 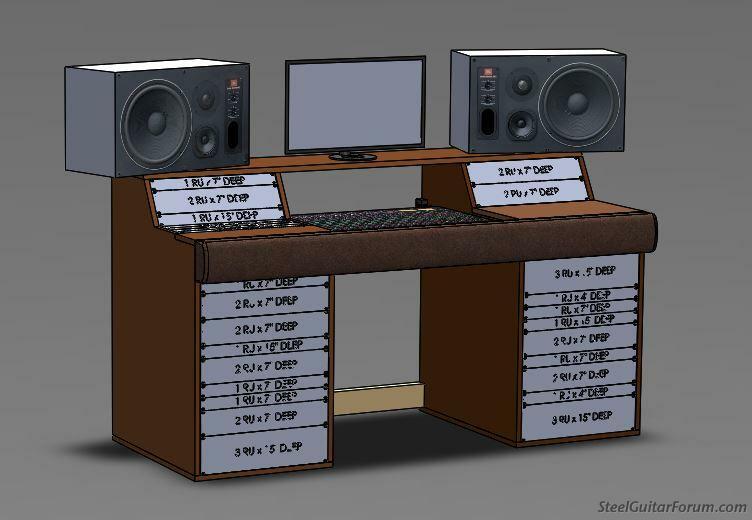 In a real control room, this desk wouldn't work anyway – to small, not enough room for multiple bodies to crowd around. 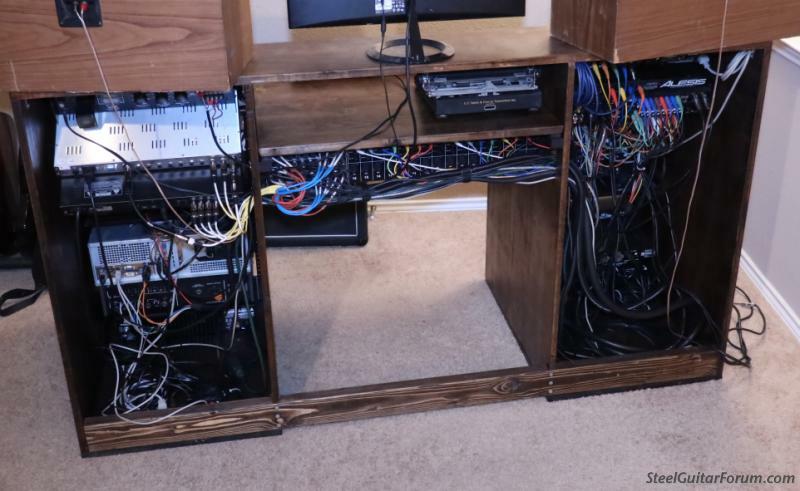 The basic layout might work for a remote truck, but you'd want more than a 16-channel board for that. Also, these monitors would be way too close; they'd need to be hung back a ways and maybe some nearfields on the overbridge. That's not even getting into what the room would need, like acoustic treatment, etc. 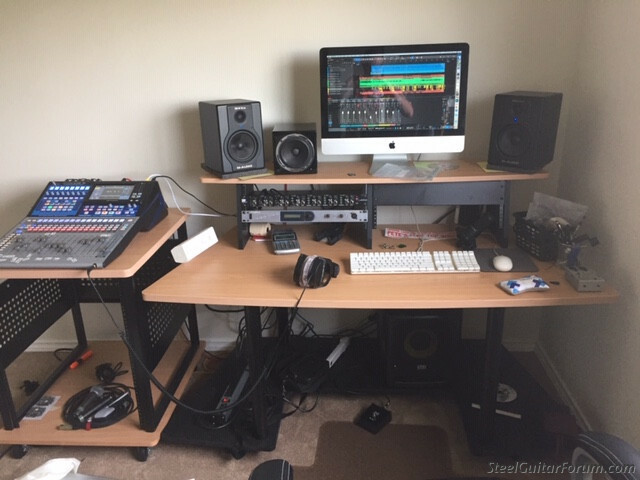 Well, the larger the desk the further away everything is for mixing, your ears go out of the triangle to reach for tweaking and reflections occur causing comb filtering off a large mixer/desk. Your desk is not too small IMO. Yeah I did notice your 4412's are mismatched. Those are midfields, passive while there are better monitors out with a smaller footprint if space is an issue. Even the old Mackie HR824's were designed to be used if the desk is close to wall. But I understand run what you brung. After long Grammy award years behind massive mixers, Dave Pensado's Argosy desk. Just enough room for the main man. The nice thing about digital is you can mix in the box and reduce the mixer's footprint for getting the sound from the speakers to your ears without the real estate. 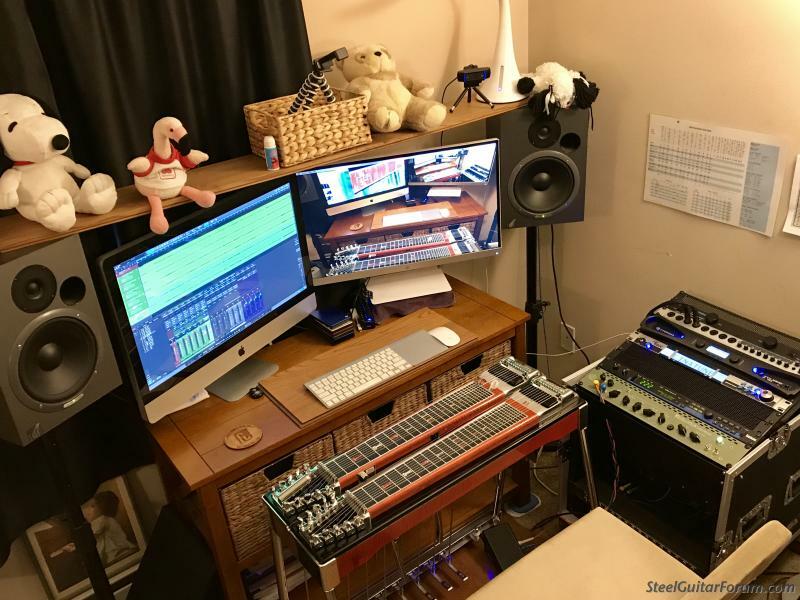 Indeed, there are many nice things about digital, but I still prefer the board for what the board does, sonically – hence my hybrid use of both types of technology, where I like to use it. Very impressive. The removable center desktop surface really caught my attention. What a great idea! You mention refinishing from the semi-gloss.Just curious as to what finish type would you be looking for? Semi-gloss or gloss would be okay, and it would be nice if it were something that I could apply over the finish I have now (after cleaning it first) but I might end up giving it a sanding anyway to fix some stain spots, so that probably doesn't matter. If I can get all of the polyurethane off, I might think about use tung oil. I don't want lacquer – too hard to apply and not durable enough. I set up and use it live so I like this as I reset it regularly. It is on wheels and has trays in the back to lay cables in. Monitors at ear level sub below.